Awnings have plenty of different functions, and they all improve your experience. Awnings have plenty of different functions, and they all improve your experience. In a business sense, it’s a clear way to maximize the value of your property. Awnings have the unique capability of improving experience while simultaneously attracting customer attention and visibility. 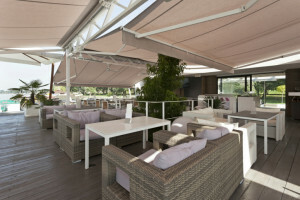 Installing a retractable awning can take these benefits and multiply them. Not only will you see an increase in business and favorable reviews, but you’ll also realize that costs will dramatically drop. When the sun is shining, it directly impacts the temperature of your building, meaning things fluctuate. The interior can heat up to an excessive amount, making your air conditioning system work over time. On the other side, there are times in the winter where you actually want the sunlight to shine through, that way you don’t have to overuse the heating system. By identifying a smart area to place your retractable awning, you can effectively control the amount of light coming in, which will save you costs on the dreaded utility bills. In a restaurant, for example, space is incredibly important. The more space that’s available means more potential for business to flow through. Outdoor seating, depending on the weather, can be extremely valuable to businesses. Retractable awnings allow for this to be a reality. Not only does it provide a larger amount of seating, but it gives you a clear advantage of other similar businesses. While retractable awnings are mostly used for shade, they also have the ability to promote your brand. Branding is becoming increasingly important in today’s world, and it’s always smart to increase visibility in any way. By selecting a color and design that stands out, you can boost the amount of customers that flock to your establishment. Retractable awnings with this type of aesthetic give companies an edge.